Enter the new 2010 HSN Great Gift Giveaway to win 1 of over 4,500 prizes @HSNtv. 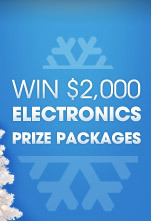 Win from a $100,000 prize pool, including HSN Gift Cards and eight electronics prize packages, each valued at $2,000! Sweeties Note: PO Box addresses not allowed. Entry Limit: Each participant may enter the Sweepstakes one time per day up until 12/14/10 at 11:59 p.m. ET and play the Instant Win Game one time per day during the Promotion Period. Bonus Sweepstakes Entries and Instant Win Game Plays: During the Promotion Period, after completion of an Instant Win Game play in which you receive a lose message, a random number of bonus Instant Win Game plays or Sweepstakes entries will be generated and awarded. If you receive a bonus Instant Win Game play, you must use it on the day you receive it or it will be forfeited. (8) GRAND PRIZES (1 per Entry Period): An electronics bundle that includes a TV, camera, headphones, and laptop. Sponsor will select specific make and model of each product in its sole discretion. ARV: $2,000. (16) FIRST PRIZES (2 per Entry Period): $100 HSN gift card. (4,500) SECOND PRIZES: $20 HSN gift card.